Our main pedestrian entrance is accessible from London Road, via a footbridge with two sets of steps. You will find us beside the Registers of Scotland building. The entrance to the parking area is via Restalrig Road South. Take a left before the bridge into the car park of the Registers of Scotland building, then follow the railway line to the back of the brown brick building behind theirs. Access to our building is available via a big blue door at our basement entrance. Car parking spaces belong to our neighbours, the Registers of Scotland. No parking available between the hours of 8am to 6pm, Monday – Friday. You must find a parking space elsewhere (e.g. on street parking). Disabled parking is available, but limited to 4 spaces and for Blue Badge holders only. If you have any concerns regarding disabled parking, please see a member of Edinburgh Palette staff. All drivers must sign in and record their vehicle registration number every day. Overnight parking is prohibited. Loading and unloading on drop off and pick up basis only and disabled parking is available. 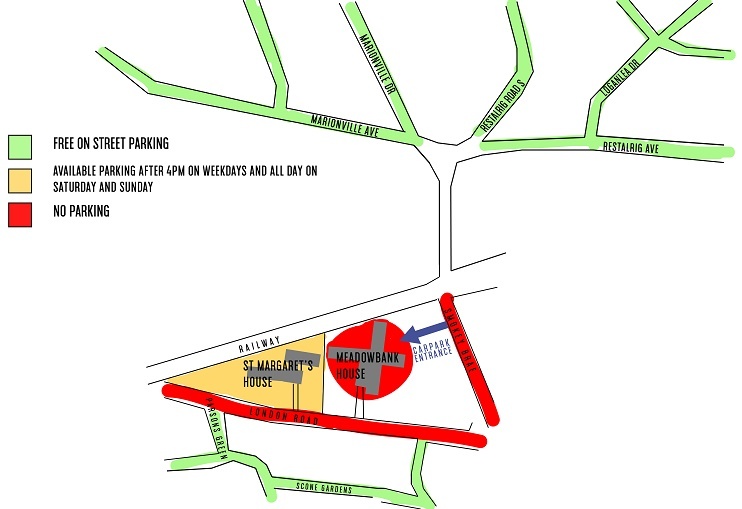 The map below shows where you’ll be able to find free on street parking. St Margaret’s House has several frequent bus services which connect it with the city centre, Waverley train station, the bus station and other parts of the city. or ramp. We are next door to the Village Hotel and Spa. vehicles. Overnight parking is prohibited. The 113 will take you past both St Margaret’s House and 525 Studios.